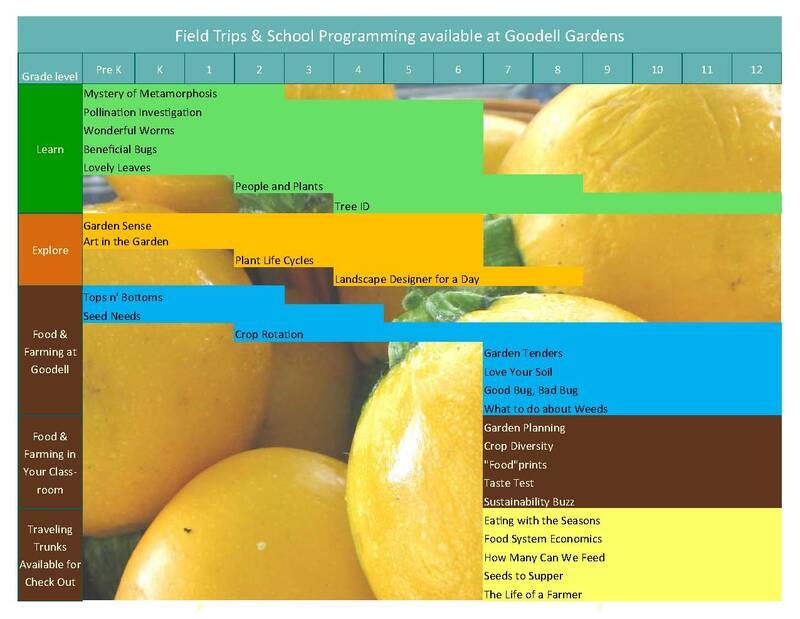 Bring your class or kids group to Goodell Gardens for a Field Trip! Goodell Gardens Field Trips are offered Wednesday - Friday, May 1 through October 31, with start times as early as 10 am! Fields Trips must be scheduled at least two weeks in advance so that we can provide your students with an extraordinary educational experience in our outdoor classrooms. Click here to see our full offering of Field Trips. 2. Your contact information and the best way to contact you. 3. Your first and second choice of field trip dates. 4. The age range of your group(s). 5. The number of students in your group(s). 6. What type of program(s) and which class topic(s) you are interested in. 7. What time you would like your Goodell Program to take place (start and finish).